Many Australians are embracing the convenience of apartment living and learning to lead a more compact life. No lawns to mow and less cleaning chalk up ticks, but what about coping with a small kitchen? 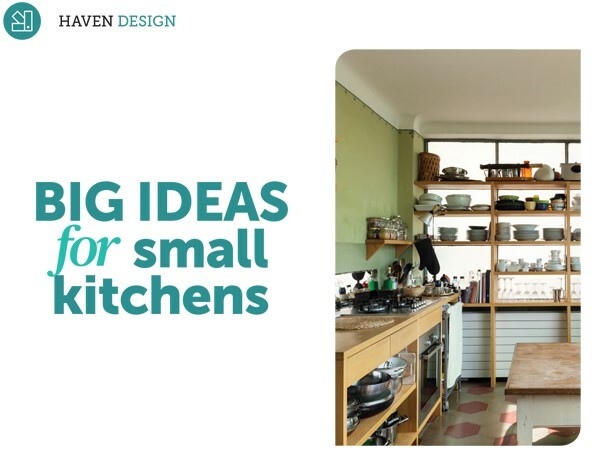 You might think a tiny kitchen means up-sizing take-aways and downsizing on dinner parties. But there are plenty of ways you can save space in the most modest of kitchens without cutting back on culinary creativity. Look for ways to hang whatever you can. There are a plethora of adhesive and screw-in hooks and hanging devices to help overcome a lack of cupboard and drawer space. Hang frequently used items (think strainer, whisk and oven mitts) instead of those rarely used to avoid dust and grime, and maximise your cupboard space with hanging racks for spices and jars. Give your knife block the chop and replace with a magnetic knife strip. Create valuable drawer or cabinet space by stashing bulky baking dishes and trays in the oven. Just be sure to store only oven-proof items in there, in case you forget to take them out before you turn the oven on! Add a mobile bench and storage with a rolling cart or butcher’s block that has shelves underneath. Use the shelves as an extension of your pantry to store tinned and bottled goods and make the top a food preparation space so you always have room to move. Roll in and out as needed. There’s no rule that says all your food has to be kept in a purpose-built cupboard in the kitchen – it’s just usually easier that way. If short on pantry space, consider another piece of furniture that serves the same purpose. Add shelves to an old cupboard and paint it to suit your décor or snag some space in the linen or laundry cupboard to store unopened tins, jars and bottles. Gadgets are great but they take up stacks of room. If you can afford it, consider an all-in-one thermo appliance, which cooks, minces, chops, grinds, whips, simmers, steams and kneads, while taking up no more bench space than a medium toaster. On a budget? A stick blender and a hand mixer should be enough for your blitzing and baking needs. Store kitchen items you don’t use very often in plastic boxes with lids. Label the containers and stack them anywhere – in or on a wardrobe, in the garage or in the laundry. Consider installing your sink or oven in a corner to maximise what otherwise could be dead space and create a more practical workflow. Fill a corner cabinet with a lazy Susan. If you have a dishwasher, chances are you don’t need a double sink in your compact kitchen. If you can’t replace two sinks with one, place a chopping board over the smaller sink and use it as extra bench space. Most chefs have to cook in compact work spaces so they learn to work efficiently and neatly. Measure and chop all of your ingredients before you start cooking and clear your work space as you go.